Duncan Chisholm’s beautiful album from 2008. Farrar won the title of “Album of the Year” at the MG ALBA Scots Trad Music Awards. Includes The Farley Bridge and Lorient Mornings. Part 1 of the critically acclaimed Strathglass Trilogy. 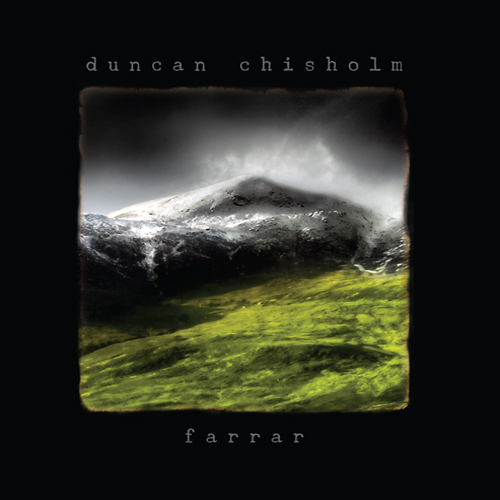 Farrar is an album in a series by Duncan Chisholm (of Wolfstone fame). 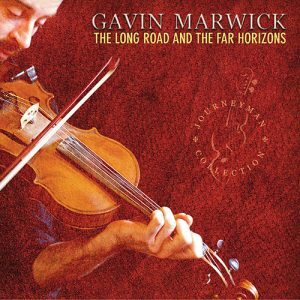 There are many beautiful slow fiddle tunes (slow airs) with a few quicker tunes all exquisitely played with great backing musicians. 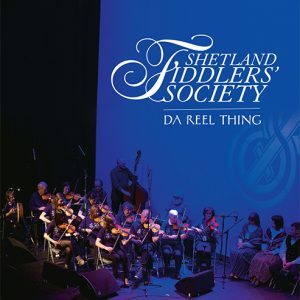 One of the best examples of traditional Scottish fiddle music in a modern style. I absolutely adore this cd. So haunting in its melody, and enchanting and warm to listen to. To close my eyes and listen to the subtle strains and lilts of the melody is transportation to peace. I thoroughly recommend it. This album is just gorgeous. Oddly for me, since I have never liked the fiddle and would run a mile to avoid being subjected to a collection of folky fiddle tunes. I have had this on the stereo on and off for a month and never get tired of it. The tone on the fiddle is beautiful throughout, no scratchy sawing here. This probably accounts for a lot of its power, along with nicely judged phrasing. There are a few self-penned tunes, and quite a few from the usual scottish suspects, I particulary like the version of 250 to vigo (a shooglenifty tune). And the visuals match, some wonderfully atmospheric photos. This is a superb album. It works very well as a whole – it has a sustained ‘feel’, and the programme of tunes is carefully paced. It’s mostly slower tunes, but there are a sprinkling of more upbeat tunes too. The cover art does a great job of pointing to the music – it’s deeply atmospheric stuff. The tunes really have room to breathe around the classy understated accompaniment – Kris Drever’s playing contributes much to the ‘less is more’ approach. The fiddle playing is amazing and Chisholm’s phrasing is impeccable. Another bonus for me is the mostly acoustic feel of the album – a pet hate is the omnipresent cheesy ‘new age’ keyboard background that seems to blight many otherwise excellent traditional music albums. This recording is beautiful. Duncan’s consummate, emotion-rich playing evokes within you feelings of peace, calm and joy one moment, and has you wanting to dance the next. He plays fiddle with all the technical mastery of the classical violinist, but imbues his playing with such depth of feeling that you’re instantly drawn into the soul of his music. Tunes like Lorient Mornings (no doubt inspired by the unbelievably excellent Breton festival of the same name!) are so poignantly beautiful that they hurt. Livelier tunes such as 250 to Vigo and The Farley Bridge are packed with rhythm and drive. 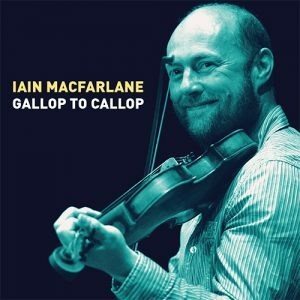 This is a gorgeous recording that I return to again and again when I want to concentrate on listening to beautiful music played by the most emotionally expressive of fiddle players I could care to name. 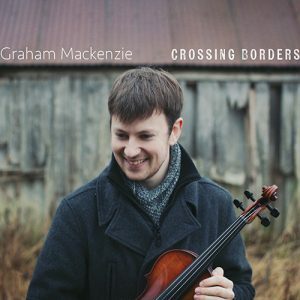 I first became familiar with Duncan Chisholm through his work with Julie Fowlis’s Band. I last saw him with her in Bath in April. I have always enjoyed music with Celtic roots and I thought it was worth giving this CD a try. I have not been disappointed as his playing throughout is excellent. My only slight reservation is that I wish he had included more up tempo tracks. If he had done so, I would have without hesitation given the CD 5 stars. However, it is still well worth listening to. 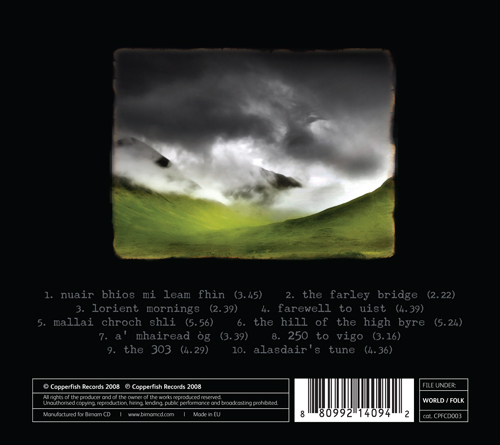 For the lover of Celtic music, "Farrar" will be high up in the list of truly stunning albums of 2008. Look at the album artwork, and you know what you’re in for…a wonderfully "moody" (in the best sense of the word) record containing simple, yet incredibly powerful tunes from the Highlands of Scotland. There are a number of self-penned melodies too, such as the haunting "Hill of the High Byre" (magical – listen to it in the car and turn up the volume as much as possible!!) or the enchanting "Farley Bridge".